Writing – Since 2002, I have written over 500 news and feature articles for a wide variety of scientific media outlets, ranging from academic publications (e.g., Nature, Nature Methods and Nature Biotechnology) to mainstream news magazines and websites (e.g., SEED, Scientific American, Wired.com, JustGarciaHill.com) to institutional publications (e.g. print and online content for RIKEN, Hunter College, Max Planck Institute and TGen). You can see some of my work here. My educational and research background is in genetics and cellular and molecular biology. However, I have written about a broad array of science and technology topics, including biomedical engineering, chemistry, synthetic biology, public health, bioethics, science policy, biotechnology and intellectual property (among other subjects). I’ve also prepared several corporate white papers and research documents about the development and use of internet-based scientific tools and trends in scientific publishing, and a book chapter on bioethics in genetic research. Editing – I edit scientific manuscripts for style, content and grammar, and my current roster of clients includes researchers at Harvard University, The Rockefeller University, Stanford University, UC Davis, the RIKEN Brain Science Institute and Columbia University. In the past two years, I have helped prepare more than 50 articles for eventual publication in leading peer-reviewed research journals, including Proceedings of the National Academy of Sciences USA, Journal of the American Chemical Society and Nature Reviews Molecular Cell Biology. I have also handled editing for a variety of other projects, including website content and book chapters. Photography – Although it’s not something I do ‘professionally’, I love taking photographs. I’ve traveled a lot and spend a lot of the time between travels wandering Philadelphia with my dog. Some people seem to think I’m pretty good at the whole camera thing, but you can take a look at my work and decide for yourself. Please feel free to contact me about potential projects or collaborations – I’m always up for a challenge and will at least consider just about any interesting idea that isn’t likely to be associated with a prison sentence. In the past, I’ve had friends successfully talk me into co-writing a screenplay for a science-fiction thriller (currently in post-production) and performing in an off-off-Broadway play that I also co-wrote (sorry, no link to that). Which more or less sums me up – I’m interested in a great many things, and have a hard time staying entirely focused on any one of them for too long. I see it as a feature rather than a bug. In college, I bounced back and forth between history and biology. When I finally made up my mind, I spent ten years working in various molecular biology labs until one day – when I was (in principle, at least) well along towards my PhD – I realized that I was a pretty crappy scientist. I knew it. My advisor knew it. I’m sure the mice knew it. I liked science and I understood it… but I really didn’t have much business conducting it. So I cut my losses and left with my Master’s degree, moved to the Lower East Side (back when an unemployed former grad student could still afford to live there) and started looking for work while surviving on a diet of bagels and half-price happy hour beers. I gradually broke into the scientific publishing world, starting as a lowly spreadsheet-monkey. Having demonstrated my meeting-scheduling and binder-assembling acumen, I managed to win enough trust from my coworkers in editorial to start getting opportunities to write short news features and press releases here and there. Over time, I eventually got enough experience under my belt and learned the journalistic ropes well enough to become an Assistant Editor as part of the founding editorial team of Nature Methods. I stayed there for several years as News Editor, and later became the Technology Editor for both that journal and Nature. From there, I went to Seed Media Group, where I was part of a small team looking into the development of new technology tools for scientists – during that time, our group partnered with several members of the ScienceBlogs community to launch the highly successful ResearchBlogging aggregator, which collects thoughtful discussions of peer-reviewed research from throughout the science blogosphere. But I missed writing – and more importantly, I missed traveling… something I used to do a lot more often. So I gave my notice, and went on a six week expedition through Argentina and Chile, where I rented a pick-up truck and took a 5000-kilometer solo drive to Tierra del Fuego and back, while blogging sporadically about the whole thing. With that out of my system for the time being, I came back to the US, set up shop in Philadelphia, and have been working as a freelance writer and editor ever since. I still focus on science mostly, but like I said – I like other stuff too much. So welcome to my website! I try to update it when I can, and I’ve made many good faith efforts to blog (really, I didn’t slip into a coma some time back in early 2017! ), but… you know how it is. Past visitors to my site may be aware that in late September 2012, my pup Kern passed away at the ripe old age of 12. I’ve written a little tribute to him here if you’re a fellow dog-lover or feeling sentimental. 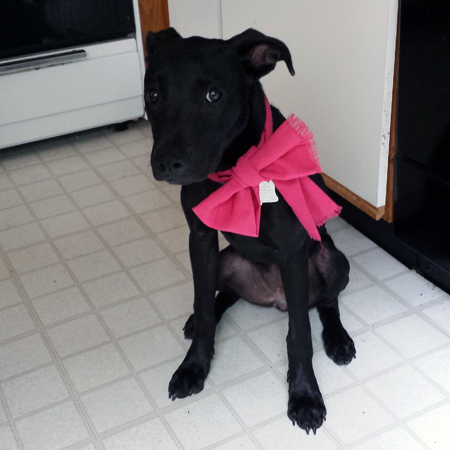 Mina is a darling lunatic of a black lab/pit-bull mix, named after Mina Harker from Dracula. My girlfriend and I had a debate – I wanted a big dog, she wanted a smaller dog. So as a compromise, we got a dog that starts off small and became big very, very fast. 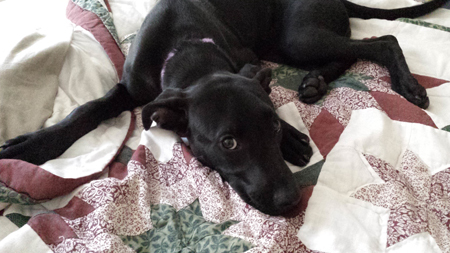 As a young dog, she was extremely leggy and clumsy, kind of like a panther on stilts. She also has alligator jaws, which she previously put to dark purpose destroying shoes, belts, socks, underwear and “indestructible” dog toys. Now, at age 5, she’s settled down a lot, and with the exception of routine bouts of the zoomies, she’s a whip-smart sweetheart who loves receiving ear scratches while she idly hatches her next diabolical scheme.